Apple is continuing to collect street data across the globe, possibly ahead of launching its own “street view” mode for its Apple Maps platform. As of the writing of this article, Apple data collection vehicles have mapped at least 41 states in the U.S., as well as areas in other countries such as Croatia, France, Ireland, Italy, Portugal, Slovenia, Spain, Sweden and the U.K., according to a webpage dedicated to tracking the Apple Maps vehicles. Apple continually updates the page with new locations where its LiDAR-equipped vehicles will be collecting data. Between April 16 and April 29, for example, the company’s vehicles apparently drove through a wide range of areas across several countries — including recently added regions in Iowa and Maine. Blurring sensitive information seems to hint that Apple is developing a 3D street-level mode for its Apple Maps platform. In other words, Apple may be continuing to work on its own version of Google’s Street View. The Apple Maps vehicles first hit the streets in 2015. Around the same time, 9to5Mac broke the news that Apple may be working on a Street View competitor. Writer Mark Gurman, who now works for Bloomberg, reported that the Cupertino tech giant launched its in-house to reduce its reliance on third-party services such as TomTom. 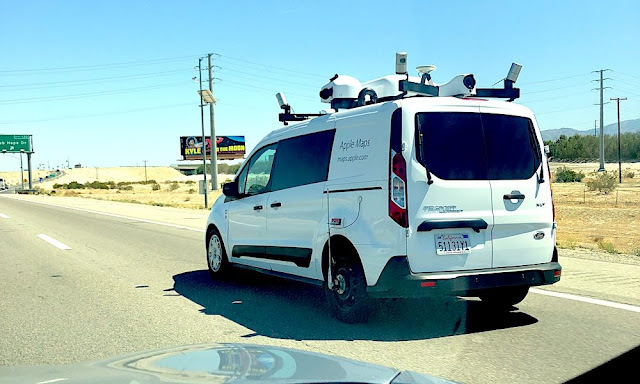 In addition to a street view mode, Gurman wrote that the in-house data could help Apple refine and revamp its proprietary mapping platform, citing sources who were familiar with the matter. At the time, Gurman added that Apple may switch entirely to in-house data by 2018. Back then, some speculated that the vans could be tied to Apple’s self-driving car project. But since then, it’s become increasingly clear that the company’s actual self-driving car fleet is part of a separate endeavor. Of course, we have no idea when Apple will launch its own 3D street view mode. But with more than three-quarters of the U.S. surveyed to date, it might just be over the horizon.